Place the mixing blade into the empty bread barrel. Place the bread barrel into the Bread Maker and fix it by turning it at a clockwise direction (ensure it is properly fixed). Close the cover and on the power. Approximately 2 hours later, Bread Maker will beep; open the cover and pour in the Oreo bits onto the dough, close the cover and press START. Bread Maker will continue to operate as per programmed. Another approximately 1 hour later, Bread Maker will beep again signaling completion. Off the power and open the cover. Using the hook provided, bring the barrel holder up (careful, it’s hot!). Hold the holder using a cloth or mitten, remove the barrel by twisting it at an anti-clockwise direction. While the bread is still hot, remove it from the barrel by holding the barrel upside down using a cloth or mitten and shaking it (do not use sharp object to try to get it out). 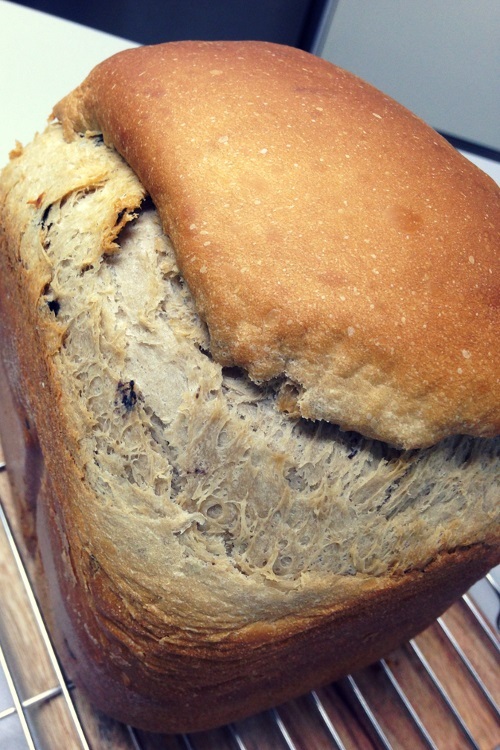 If the bread sits inside the barrel for too long, it may wrinkle and affects the texture. Slice the bread once it has cool down. Enjoy (tasty on its own). 🙂 Note: if the mixing blade is stuck into the bread, remove it before cutting the bread. Just need to wash the bread barrel and mixing blade with mild detergent and non-abrasive sponge. For the Bread Maker itself, use a damp cloth to wipe the interior and exterior of the machine and leave it to dry. All cleaning/washing should be done only when the Bread Maker has cool down. Video says first beep to place Oreo which is approx. after first hour during 2nd kneading. But above article says after 2 hrs (3rd raising). So which is correct?